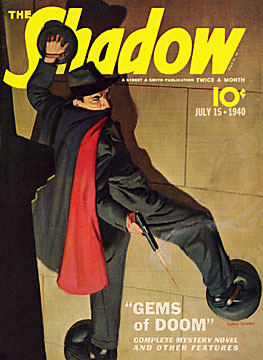 The Shadow - July 15, 1940 - Gems of Doom. All reproductions are printed on a heavy weight acid-free archival stock which provides excellent sharpness and color reproduction. Any defects in the original pulp covers (folds, creases, tears, discoloration, etc.) have been digitally removed or corrected to enhance the image and make for a superb print.